Salicylic Acid is a chemical that has anti-inflammatory properties, which helps to calm and reduce inflammation. It slows down the shedding of skin cells inside the follicles to reduce the incidence of clogged pores. It may also breakdown whiteheads and blackheads. The concentration of Salicylic Acid found in over-the-counter products is pretty much in a low and safe level, so it's less likely to cause irritation or peeling. In my opinion, it is effective in treating non-inflamed and inflamed pimples, but it may take a longer time to heal big, painful cystic acne and it may not be very effective against severe acne like nodules. Benzoyl Peroxide (B.P) zaps (P. acnes) bacteria, dries excess oil and remove dead skin cells clogging pores. It is also a chemical but is stronger than Salicylic Acid. Ideal for inflamed pimples. Generally, Benzoyl Peroxide comes in 2.5%, 5% and 10%. People with sensitive skin have to be cautious with the level of concentration because the higher the concentration, the more it may irritate your skin. 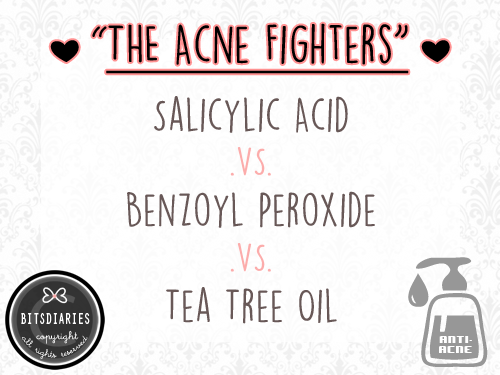 In my opinion, Benzoyl Peroxide treats pimples (including cystic acne) quicker than Salicylic Acid. On the downside, it may cause mild to severe dryness and some peeling. Tea Tree Oil (TTO) is a natural, powerful antibacterial ingredient that kills a broad spectrum of bacteria. It penetrates into the skin and dries out all kinds of pimples quickly. Tea Tree Oil is often found in varying concentrations. I think the lowest concentration of Tea Tree Oil found in over-the-counter products is 2% or 5%. Again, people with sensitive skin have to be cautious with the level of concentration because the higher the concentration, the more it may irritate your skin. The highest concentration of Tea Tree Oil I have seen is 100% — my brother is using 100% pure TTO and it works amazingly for him. In my opinion, TTO is the most effective acne fighter and as it is a natural ingredient, it may be less irritating than B.P. Despite that, you still have to be cautious with TTO as it may cause an allergic reaction. 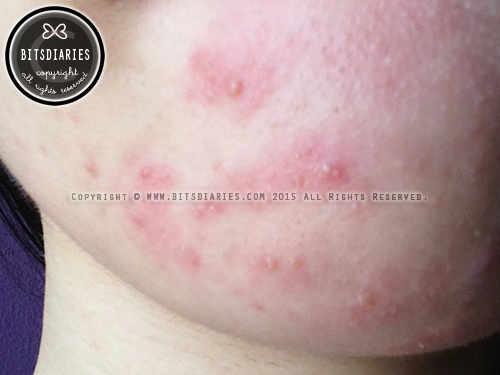 Symptoms of allergic reaction to TTO: Redness, itching, dryness, raw and bumpy patches/rashes. FYI, I have been using Salicylic Acid -based products over the years, ever since I suffered from bad acne (refer to "My Acne Story"). So far, it hasn't caused any issues to my sensitive skin. Anyway, my advice is to start from the mildest active acne ingredient with the smallest concentration. If your skin doesn't respond, then work your way up to stronger ingredient. By doing so, you will find out your skin's tolerance as well as reduce the chance of getting skin irritation. Check out my article on "5 Acne Spot Treatment Recommendations" and "Understanding The Types Of Acne — Whitehead, Blackhead, Papule, Pustule, Cyst, Nodule". I have read that we need to use only one type of active ingredient when we r treating skin troubles...? Should i keep my innis lotion away n get Etude Ac lotion instead? What should I do? Well, I don't think Butylene Glycol is an active acne ingredient. Anyway, FYI, Innisfree Bija Anti-Trouble Facial Foam and Spot Essence are formulated with Butylene Glycol and Salicylic Acid. Hence, I think it should be fine to use both ingredients together.